Are you eager to experience something new and interesting? Playtech provides the best trip ever to an unknown world of the Aztecs. Explore 5 reels of different Pyramids, caves and Statues to find the way to the biggest treasure. Moreover, a hot female Explorer will guide you through these 20 line adventures. Don’t you even think to get afraid! 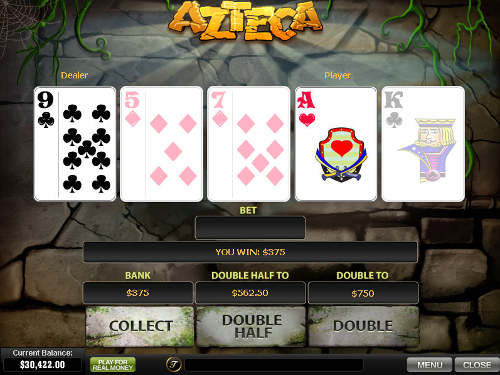 See that beauty from Azteca Slot Machine? She lays account with you. Spin the reels to get closer to your destination. 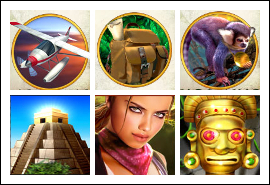 Besides, if you hit 3 or more Lara Croft-like ladies, you will be automatically awarded 12 Free Spins coming along with 3x Multiplier. All the trip creates more and more possibilities for you to get richer. 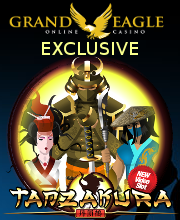 Why don’t you catch at least 3 Golden Statues and activate Chamber of the Gods Bonus Game? Wanna more? So grab 4 or 5 bonus icons to multiply your total prize by 5 or 27 times accordingly. Really, what could be better? Entering the feature, you appear in the first stage to collect the Golden Statues and reveal a cash prize. Are you so lucky to enter the Temple of the Sun? Congrats, you are now in the second stage. Feel free to pick between 2 orbs and find out the number of your additional Multiplier. The things go better with each your step. Hey, doesn’t your win at the Base Game satisfy you? 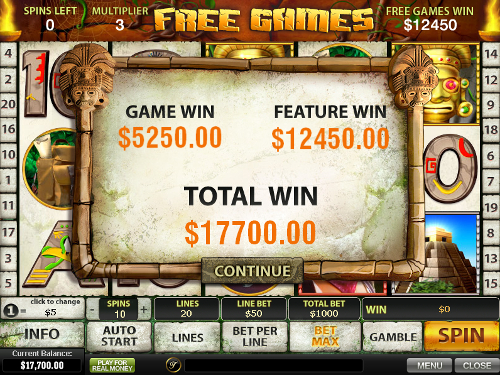 Use the Gamble Feature each time you have a successful spin and make your amount increase. All you need is just to choose a card higher than the dealer has presented and, in this way, you are welcome to Double, Double Half or Collect your gains. Pay special attention, everything depends on your prediction. Enter the Aztec Pyramid to see what gems you can find there. The wild symbol provides more ways for you to catch a prize. Replacing the ordinary icons, the Pyramid doesn’t let a spin to pass by. Moreover, you will love this symbol more when 5 of them will bring you the highest profit. 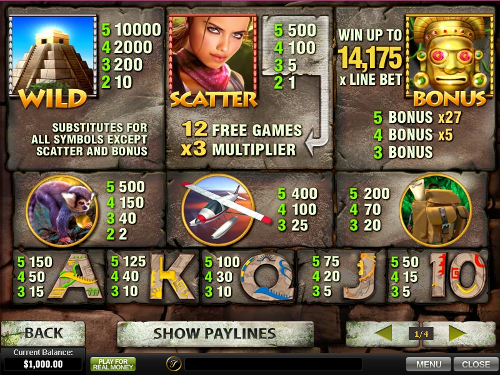 A hotty of the slot is the scatter symbol. This pretty woman makes all your gains get bigger and increases your mood with her charming actions. Just meet the female Explorer for 2, 3, 4 or 5 times and obtain 1x, 5x, 100x and even 500x Multiplier even without having a winning combo. Hmm… she will look better beside the hot boys from Chippendales Slot Machine, huh? 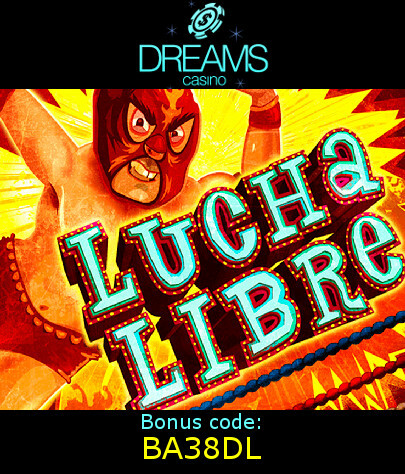 To get closer to the big wins, you are to select a coin size ranging from $0.01 up to $5 and make a spin. To achieve great deals, one should take a fair risk. Thus, place 10 coins a line and be sure, even the max bet of $1,000 would seem very inconspicuous once you get a prize. The stronger you want to catch the fortune, the sooner your wish will come true. Don’t think of any difficulties, the Aztec Pyramid takes upon itself all the odds. The only thing you should do is to watch out to collect a line of 5 wilds and receive the top jackpot of $500,000. Told you, the stake would pay for itself. Mysterious Pyramids and deserts, wild animals and dangerous caves. All that comes with large winnings, unforgettable adventures and high spirit. 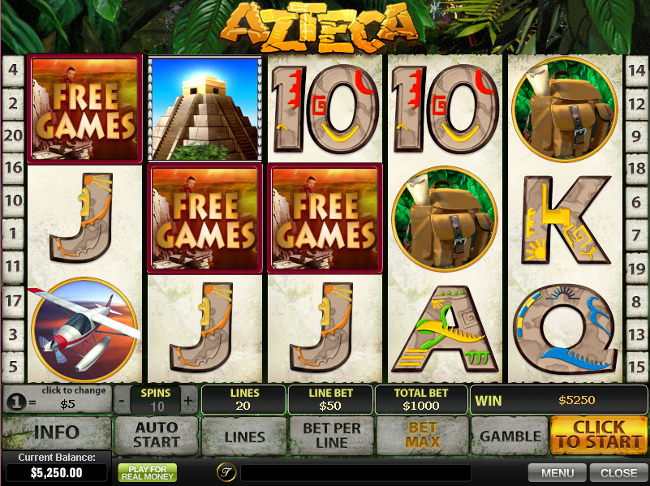 Get Azteca Slot Machine and try to come out safe and rich.